On March 8, less than 48 hours before the results were to be announced, Doug Ford sent out a mass-email that stated that "The leadership vote has been corrupted." He elaborated that "The same group of insiders that oversaw rigged nominations over the past two years has made a two-tier system that favours their hand-picked candidates over regular party members ... The party sent verification codes by email to a select group of VIP insiders." 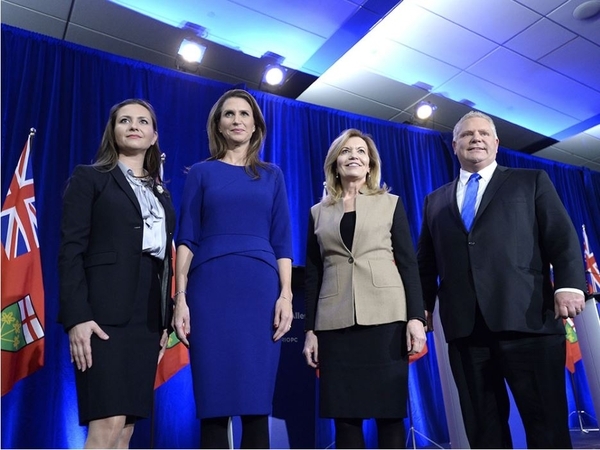 Ford, Mulroney and Tanya Granic Allen all asked for a court-ordered extension of the time to qualify to vote, as fewer than half of those who had the right to do so had navigated the maze of the procedure. Barbara managed to get her vote counted after hours on the telephone, two physical visits, and invocation of the good offices of both the Ford and Mulroney campaigns. She would not have succeeded if she were not a well-known personality to those whom she reached. It is a nonsensical voting process anyway — constituencies the PC's have no chance of winning in a general election and very few association members have an equal weight with safe districts with thousands of active party members in them. When the unrepresentative tabulation method is capped by an inaccessible selection procedure, all for the purpose of a bloodless, soulless, snoozer of a revelation of the result as calculated by unanswerable and unverifiable machines entrusted to reapply second and third choices on ballots, with three of the four candidates crying foul even before the result is rendered, drama and even credibility are trampled in the dust by malfunctioning automation tainted by old fashioned ballot-stuffing. It is a parody of a Tory effort to scale the heights of new technology, a sitcom. I have no standing to say whether Ford's allegations were accurate, but there seems to have been some combination of skullduggery by an unidentified clique with universal, equal opportunity, no-fault, officious bungling. The truth is somewhat academic, as Ford, having emerged narrowly as the winner, has not pressed the point. But the grandees of that party should note that the appearance is that the legitimate leader was ejected in a cooked-up dawn-raid smear campaign, a coup; and that a faction with considerable influence on the primitive party machinery did not make a serious effort to get a fair result. Surely Ontario's Conservatives have not got to such a pass as that, but the failure of Christine Elliott to join the other candidates in requesting a few days or a week's deferral of the count to ensure a fully enfranchised leadership electorate was unbecoming. I don't think she personally would participate in a coup against her leader or a putsch against her rivals, but the whole sequence of events has been fishy, and only without the appearance and aroma of a dead fish because the loudest protester in fact won. If Elliott had won, they would be a severely divided party. As it is, Ford should win the general election. He took 34 per cent of the vote in the Toronto mayoral election four years ago (out of 980,000 votes cast), 11 points ahead of the NDP's Olivia Chow and only six points behind John Tory at the head of what was effectively a Liberal-Conservative coalition. He should swarm the Liberal stronghold in Toronto in the provincial election and maintain Conservative strength elsewhere. Whatever his shortcomings, Rob Ford cut Toronto's expenses, "the gravy train" as he called it, at a rate of $640 million for a full mayoral term. With his brother, Ontario gets all Rob's good points and few of his weaknesses. The top three contenders, and Rod Phillips, should be the nucleus of a strong government in just three months. It is an opportunity for the province, and a sweet turn of fortune for the Ford family. But the Progressive Conservative Party of Ontario should never go through a farce like this again.